Welcome to the Diablo 3 Witch Doctor Leveling Guide section of the site! The witch doctor class uses their connection with other-wordly forces to smite their enemies using dark magics, rancid plagues and swarms of vicious minions. In the witch doctor library below, you will find numerous tips, tricks, strategies and walk-throughs to help you powerlevel your new witch doctor through Diablo 3 with ease! Getting started with the Witch Doctor can be a little confusing. Part 1 of this leveling build guide teaches you the ins and outs of the best leveling skills to use in the beginning levels of the game. As you progress through levels in Diablo 3, you’ll want to make sure you’re always using the optimal skills and abilities to ensure fast leveling and minimal dying. Part 2 goes into great detail about these important considerations. 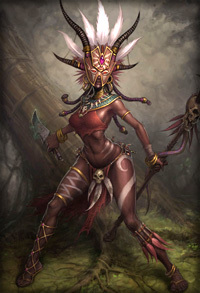 Now that you’ve made it through all of the early content, it’s time to start really defining the type of character you want your Witch Doctor to be. In Part 3, I help you choose some of the most powerful skills to maximize DPS, survivability and leveling speed. Hi there, great guide, it helped me a lot, I got a little bit lost on nightmare mode, my build wasn’t enought for the monsters, I’ve to say your skills build was really helful, now I’m on level 36. I think your guide needs and update for levels 30-40 and 40 – upcoming levels. Zombie dogs are not really efective and they die really fast.